Our 8 year old bought a trap with his birthday money. Since then he has been learning the ropes of how to trap like his big brothers. They trap possum usually…possum that like to come closer to the house and find the chickens and their eggs. So keeping the critters away is an important job. The boys requested a case of vienna sausage and some peanut butter to use for their traps. They use various other trapping incentives that I don’t care to mention or think about. Up until recently, our little trapper-in-training would lament often how he keeps catching the cat in his trap (disclaimer: it’s a box trap, no cats have actually ever been harmed in the young trappers training opps). However, this morning was different. The young trapper returned rather exuberant from checking his trap with the glorious news that he had indeed trapped a possum. “A beauty” according to him! With the help of his brothers, they carried the trap down the hill to my back door. After breakfast, I finally went to take a look at this “beauty”. I’ll take their word for it..it looked just like all the other possums to me. Everyone was very excited and I was very proud of my boy. Very proud. My little trapper is looking out the back door with me talking a mile a minute about his “beauty”. The other kids are finishing up the kitchen chores. Work is humming along. As I am looking out the back door at his possum in the trap and listening to my boy ramble on about all the great qualities of this possum. I notice something else in the trap…something with mangled feathers…yellowish, buff color feathers. What in the world? 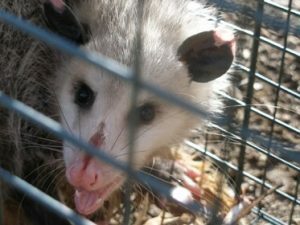 The possum is eating something with feathers in the trap sitting outside my back door. I think I zoned out then. My words jumbled into some big long outburst on how we were all going to catch some disease and die from all the bacteria breeding just inches from the kitchen door. Peanut butter is one thing… decaying, rotting, decapitated dead animals and a possum sitting on my door step is quite another! Just then, I’m smacked back into reality. ← Incubating Chicken Eggs: We have a chick!